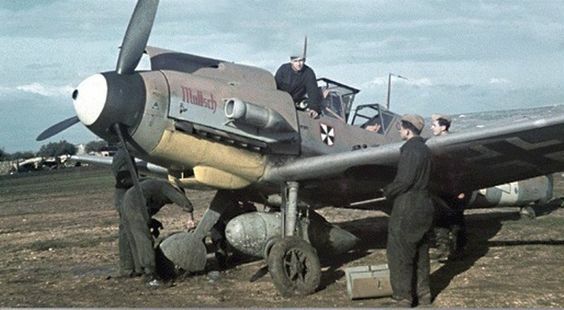 Currently at 350 euros with five days left is this very nice album featuring Bf 109s of Träger-Jasta 186 and JG 77 taken at Nordholz during the winter of 1939-40. From the seller's blurb; this album contains 72 images with a further 11 loose and 13 more not depicted of the Arbeitsdienst or 'work service' detail. These are rare images of the aircraft slated to embark as the fighter complement on board the carrier Graf Zeppelin in the so-called Träger-Jagdstaffel 186. Exceptionally sharp images of Me 109s with JG 77. All pages of the album feature text, guaranteed original. The album also features a rare close-up of the Graf von Zeppelin's coat of arms as applied prominently on the bow of the carrier and on the aircraft of the Trägergruppe II./186 (T). The carrier's air complement initially consisted of a single dive bomber Staffel, 4.(St. )/186 (T), and two fighter Staffeln, 5. (J) and 6. (J)/186 (T).